The incredible $79,- trolley camerabag! I shot a mouse. We've been plagued by mice, lately. Actually, ever since our cat was more or less compelled to move after the arrival of our dog a few years ago, the mice have returned to claim this house at night. Our dog is useless as a mousecatcher. To illustrate her worthlessness as a mouse-repellant: I've seen a mouse go into her feedingbowl and steal six kibbles of dryfood while she was sleeping 3 feet away. She didn't even flinch an eye. 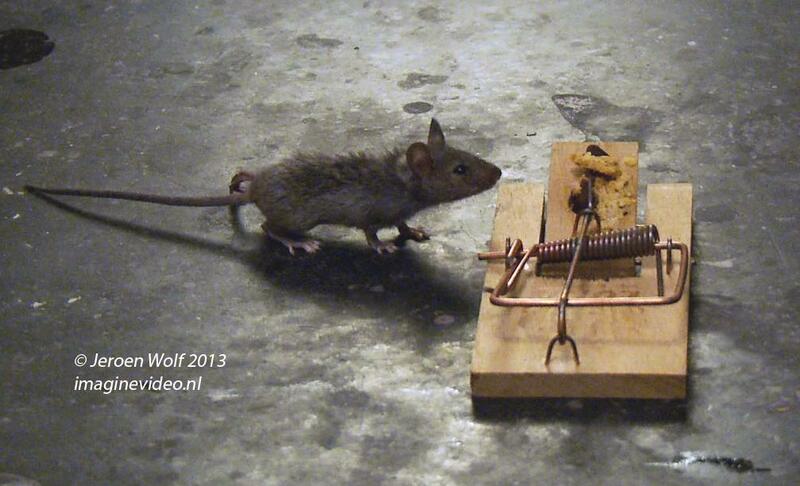 These mice are more brazen by the week and I decided to shoot them. At night, using my camera. I made a timelapse of a mousetrap and grabbed the best frame. The mouse never did take the food. She was an inch away from death. The great French photographer Henri Cartier-Bresson coined the famous photo-expression 'The Decisive Moment' to characterize a great picture. I guess he meant there is only one moment in photography that captures the essence of a scene. If you're a fraction of a second too late or too early, you missed it. That quote was made for this still. The Decisive Moment takes on an extra, existential meaning here. To bite or not to bite. A choice between life and death. The Ultimate Decisive Moment. About 3 weeks after I bought my 5D Mark III, one of the most amazing development in recent video-years has been realized by the magicians from Magic Lantern. They have been able to unlock full potential from the camera's fullframe sensor, enabling RAW video to be output directly onto the card. I am not a technical person and definitely not a pixelpeeper but the amount of information that becomes available not only in terms of dynamic range and color space but also in terms of detail is absolutely phenomenal for every shooter. Canon 5D Mark III Continuous Raw Video with Magic Lantern (1920x1280 24p) from Andrew Reid on Vimeo. 14-bit RAW on Canon 5D Mark III vs. factory default - Night Image Quality & Dynamic Range from Saad Rabia on Vimeo.